My Mom was recently visiting for a week. 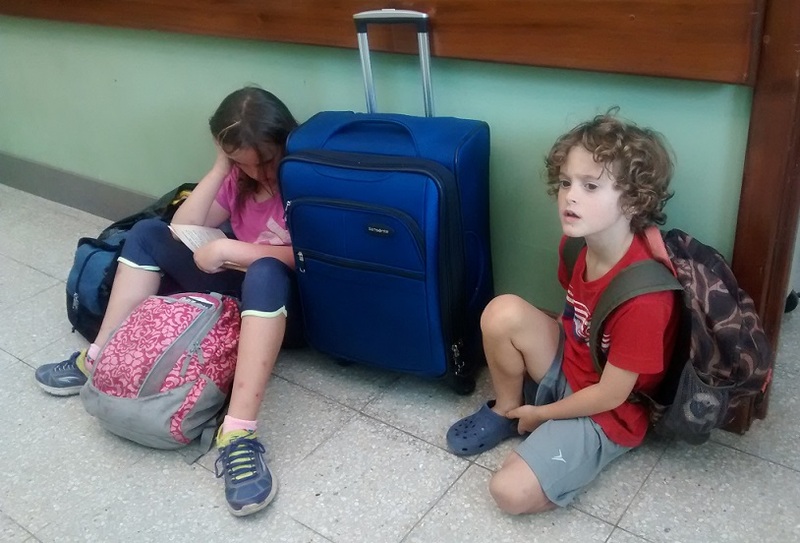 We'd not seen her in almost a year and it was her first visit to Guatemala. We started her trip with a two night stay in Santiago, Atitlan. Santiago is a pueblo across the lake from where we live. It is situated between the San Pedro and Toliman volcanoes and was once the capital of the Tz'utujil Mayans. On our first night in Santiago my Mom tripped coming down some uneven cobblestone stairs. Within a few minutes she was able to get back on her feet, that is until she tried to take her first step. OUCH! Her ankle was banged up and beginning to swell. She could not walk unassisted. We were hoping it was just a bad sprain. She spent the next day and a half in Santiago in pain, unable to put any significant pressure on the ankle. It was now evident that we needed an x-ray. 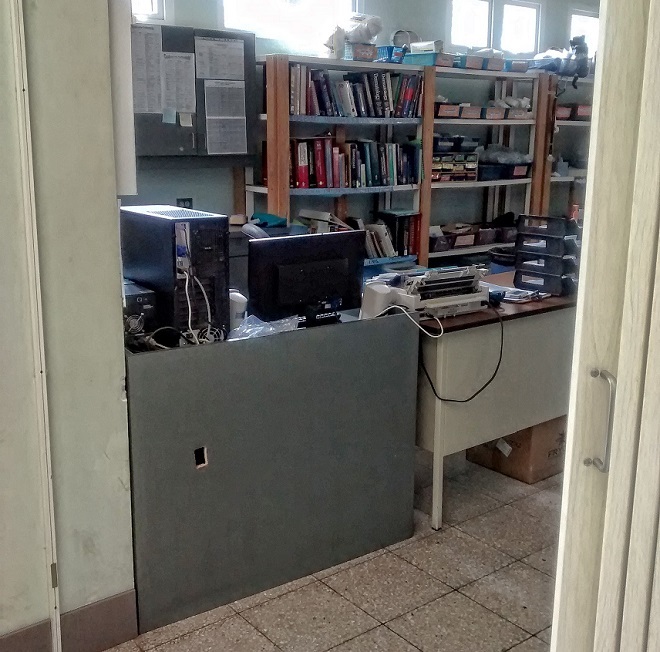 Lake Atitlan has many small clinics staffed with doctors but only two hospitals. One is public (Hospital Nacional de Sololá). While it likely would have provided free care, it would have been a two hour car ride around the lake. The other hospital is a private and non-profit hospital (Hospitalito Atitlán) located in Santiago. It was only a 10 minute tuk-tuk ride from where we'd been staying, so off we went to get my Mom's ankle checked out. A year ago I would have been nervous taking my Mom to a hospital in a third world country, but after 10 months on the road we have dropped many of our preconceived notions about things like this. We try to look at interactions like this as new opportunities to learn and become more informed (see our post "What's Behind Door #3" for additional examples). This is not to say that every interaction turns out blissfully or that I was happy my Mom was in pain, I just wasn't nervous about taking her to a hospital in Guatemala. Once again, this proved to be the right attitude. Overall we were impressed by our visit to Hospitalito Atitlán. 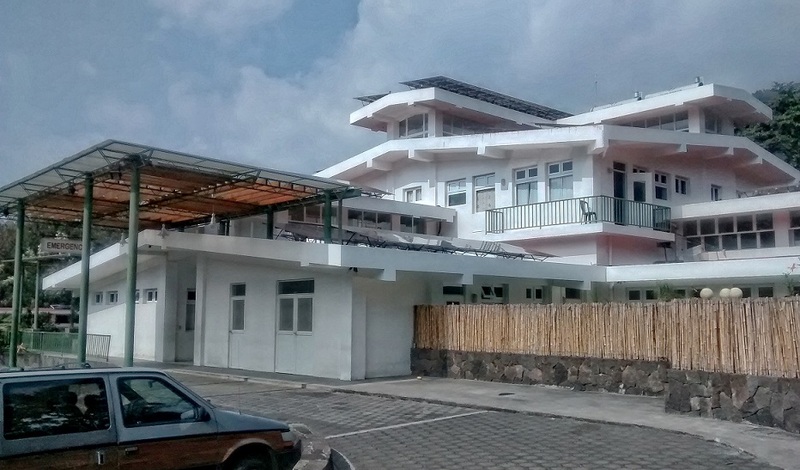 The outside of Hospitalito Atitlan. The covered area is the entrance to the emergency room. If you look closely you can see solar panels on the roof. The tuk-tuk dropped us off at the emergency room entrance. They had wheelchairs waiting right out front. I wheeled my Mom in and got her checked in. The check-in process was smooth. They asked for my Mom's name, birth date, country of residence and the names of her parents. The name of her parents? What? I told them my Mom's parents were deceased and was told that it's not important if they are dead or alive. The information is required as part of the check-in process. They use this info to differentiate between patients with the same name. The check-in station at the ER. The ER was clean and well organized. There were three other beds behind curtains to the right of the bed pictured here. Before going to the hospital that morning I gave the kids a choice. They could go to school with Mick or stay with me and continue to visit with my Mom. They both choose to skip school. The ER staff told me that kids were not allowed to be in the examination room so they camped out in the hallway just outside the ER. Both kids did great. They talked, read and played games patiently. Ela can always entertain herself with a book! A doctor examined my Mom's ankle within 15 minutes of our arrival. He only spoke Spanish and I was doing a good job translating until he wanted to know more about my Mom's medical history and current medications. I needed help for this. Fortunately the hospital always has at least one bilingual person around. In our case it was a volunteer named Mike who was working at the hospital for the next month. He filled in all of my missing vocabulary. The doctor ordered a set of x-rays. 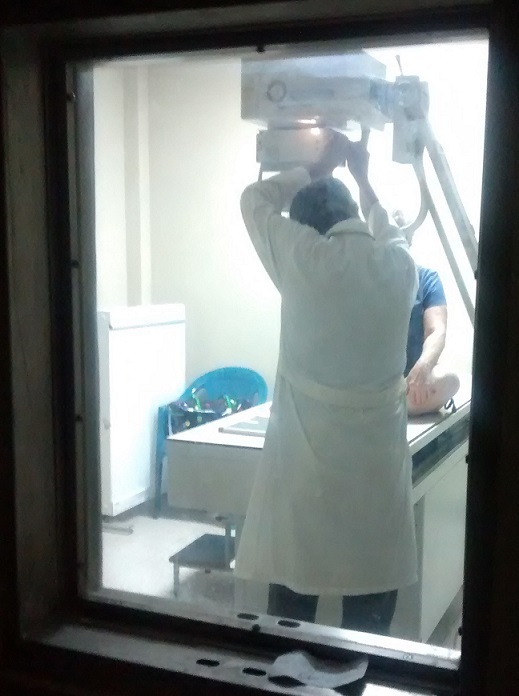 Taken from behind the lead lined wall and protective window just before my Mom's x-ray. The x-ray showed a hairline fracture. Unfortunately the swelling was so bad the doctor could not put a cast on it, so the staff outfitted my Mom with a nice protective boot. The boot was brand new and even came with an allen wrench to adjust the angle. The total cost of our visit, which included the doctor's care, x-rays and the boot was Q450 (a little less than $60 USD). I later searched the web for the same boot and found it retailing for $60-100 USD. The kids needed to burn off some energy, fortunately the hospital had this nice play area. We needed food. 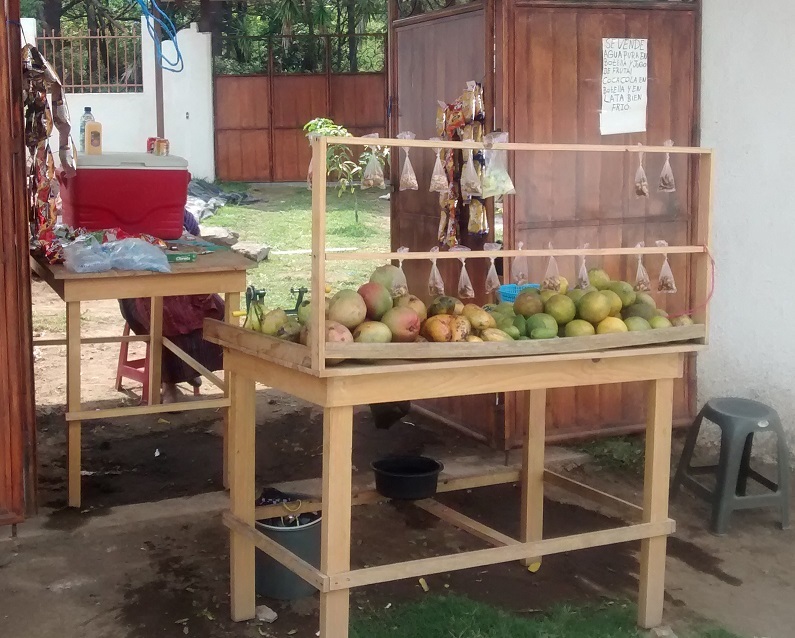 We could not find a cafeteria at the hospital but there was a good snack stand and tienda across the street from the hospital. Thanks to the hospital staff my Mom was now on the mend. Additionally, the kids had run off some energy and we were all fed. All in all it was a successful day. But how was this possible? How did we pay only $60 USD when the boot alone probably cost that much? This led me to find out more information about the hospital. Items like the boot are often donated. 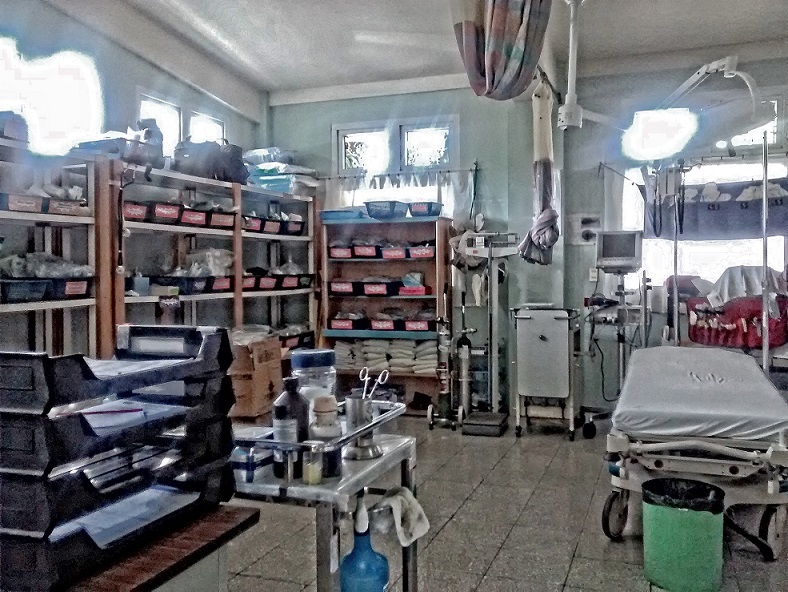 The hospital is funded roughly 60% on patient fees and 40% from grants and donations. The hospital was originally started in the 1960s by the Archdiocese of Oklahoma City after a measles epidemic that killed more than 600 children. The hospital closed in 1991 in the midst of the Guatemalan Civil War because the environment was too dangerous. Citizens formed a civic committee to raise funds to renovate, expand and reopen the hospital. They accomplished their goal in April 2005. In October 2005 Tropical Storm Stan hit the area and caused a landslide that virtually destroyed the newly renovated hospital. 16 days later the hospital was opened again in a temporary location (a former backpackers’ hotel). Donations poured in. A new piece of property that's at a lower risk to mudslides was purchased. Then a new hospital building was built and new medical equipment purchased. The new (and current) location open in October 2007. A more detailed history of the hospital can be found on their website here. Thanks to the generosity of religious organizations, corporations and many individuals this hospital is routinely saving lives, delivering babies, providing quality health care and as of last week helping my Mom to walk sooner. Donations to the hospital are tax deductible in the United States and can be made online by clicking here.